On behalf of the Ekal South Florida chapter, I want to share some exciting great news about our successful annual fundraising concert held on Saturday, the 3rd December 2011. The theme of our program was Jagruthi (meaning) Awakening. The artists and the gurus prepared their segments centred on this specific theme. The program included different forms of Indian Classical such as, Bharatnatyam, Odissi, Kathak, Mohiniyattam and Giddha (Punjab), Lavani (Maharashtra), fusion dance, Tamil folk dances, Bollywood dance etc were also showcased under folk dance segment. The vocal and instrumental music segment was presented by the prominent local internationally acclaimed musicians. We charged $25 per person for an adult ticket and had a sold-out auditorium of about 500 seats. In 2010, 300 schools were supported by this region. We set a goal of 350 for this year. An informal count indicates that we collected sponsorship for 450 schools. This increase in the number of schools sponsored is a record in our history! Even after this actual fund raiser ended, we continue to get sponsorship offers. One of our new local volunteer - Sri Shalin Mishra had made a fund raising thermometer to let the audience at this concert know of the progress of sponsorship. The thermometer readings went up as we received more and more pledges during the program. It was a novel experience and we offer and welcome other chapters, who may be interested, to use our template. Reflecting on the local participation in Ekal Vidyalaya movement, we consciously involved the local community as well for our fundraiser. This way the local community is made stakeholders for this noble effort. This strategy helped us to spread the message to a wider audience also. Only the artists were given complimentary tickets and they were not compensated in any other manner. In fact, the artists promoted our event by selling tickets to their students, families and friends. Thus we saved on artist expense of about $1800.00 also. We plan to finalize our accounting over this weekend and will share the exact data with you at that time. It’s been an eventful year for Sri Sudhir Prabhu. Last summer, this native of Mumbai, India, celebrated his 30th anniversary of becoming an American citizen. 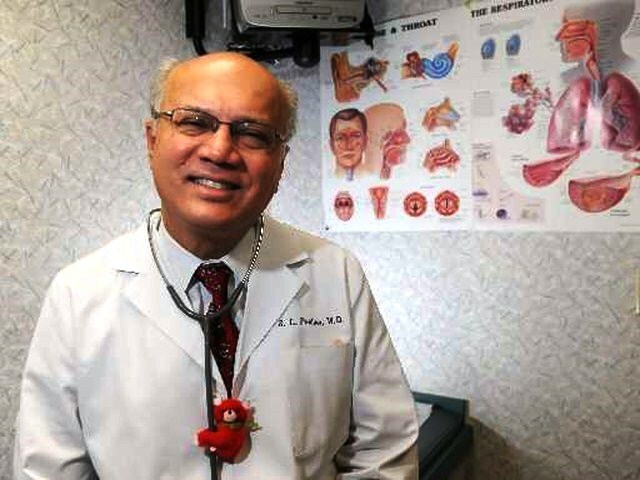 Then during this month of December 2011, Prabhu, a Jacksonville allergist, was given the Community Service Award by the Duval County Medical Society in recognition of his long-time efforts to provide asthma treatment and education to under served population. Prabhu, 61, grew up in India and was both an undergraduate and a medical student at the University of Bombay (now Mumbai), where he played cricket and basketball. He and his wife, Prasanna, whom he met while they were medical students together, decided to marry and move to the United States in 1975, to do their residencies at Long Island College Hospital in New York. “America was a beacon of culture,” said Prabhu, who knew when he left India that he wanted to spend the rest of his life in the U.S. His wife trained as a radiologist and he trained as both a paediatrician and as an allergist and immunologist. He was ultimately drawn to specialize as an allergist because it offered a variety of challenges. “It cuts across all systems,” he said. Not wanting to raise children in New York, the Prabhus picked Jacksonville as a home because they liked the city and its warm weather. They have two sons, Rohan and Shan, who both work in the health care field. Besides the pressure of work due to the increasing awareness about asthma, Prabhu was one of the leaders in the Hindu Society of Northeast Florida’s successful campaign to build a temple in Mandarin. And Prabhu hasn’t severed his connection with India. He is a leader of the Ekal Vidyalaya Foundation’s mission to build schools and to provide educational programs in remote rural India to help eradicate illiteracy and promote health education and economic development. Ekal Vidyalaya has been and is one of the best choices of many companies and associations for their CSR (corporate social responsibility service projects). The unique concept adopted by EKAL is accepted and appreciated by many a people. Now Ekal has added another feather to its crown by getting support from Indian Overseas Bank who has adopted 30 Ekal Vidyalayas in Namakkal District, Tamilnadu. Sri M.Narendra, Chairman and Managing Director, IOB handed over the cheque for 30 schools to Sri S.S. Damanai (Chairman, FTS South Zone) in the presence of children from Ekal schools during a ceremony held at Hotel Golden Palace in Namakkal on 12th December 2011. The children from Ekal Vidyalayas welcomed the Chairman & Managing director of IOB and he inaugurated the function which was followed by the welcome address of Sri Senthil (FTS Erode). After that, Dr. C.Satheesh Kumar (Joint Global Co-ordinator of Ekal Vidyalya Foundation of India) briefed about present reach and the functioning of Ekal Vidyalaya’s throughout the country. It was followed with the children performing prayer, games and patriotic songs. Sri S.S. Damani delivered the keynote address explaining about the goals and objectives of Ekal Vidyalaya movement. Thereafter, Sri M.Narendra expressed that there are many needy people excluded from the society particularly children. They are in need of good cultural values and education which creates smile on their faces and that will bless us to support more and more towards the society through organization like Friends of Tribals Society. Many higher officials, customers of IOB and Ekal Vidyalaya teachers, Committee members attended the function. The function concluded with distribution of sweets to the children. Friends of Tribals Society (FTS) Delhi chapter celebrated its Annual function on 18th December 2011, at Siri Fort Auditorium. Sri Manoj Joshi, a theatre personality and a famous Bollywood artist presented his creation - CHANAKYA (a play in Hindi). This world fame drama presentation was presented to a jam packed auditorium having a seating capacity of around 1800. On this occasion Sri Manoj Aggarwal, Managing Director of Great Value Group was the Chief Guest. Sri Rajkumar Karwa, President of the FTS-Delhi welcomed the gathering. In his key note address, Sri Manoj Aggarwal, the Chief Guest, requested the audience to come out openly to support the excellent work being done by FTS in the country. A small effective power point presentation about the activities of FTS and what it is doing in rural India was given by Sri Vijay Maroo, President, EVFI. Sri Arun Rai, Secretary of FTS-Delhi proposed a formal vote of thanks thanking Sri Manoj Aggarwal of Great Value Group for sponsoring the event for the Ekal cause. 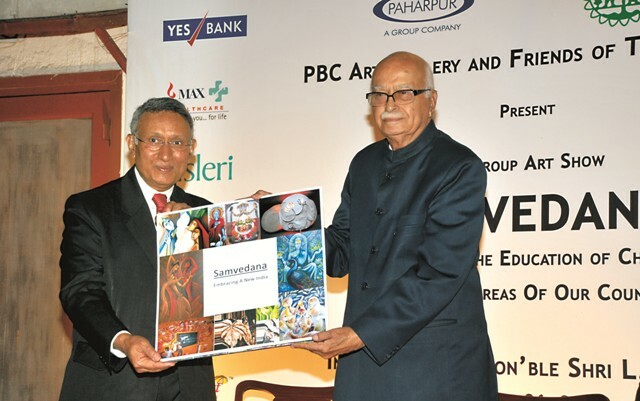 Samvedana, an art show of paintings and sculptures by renowned artists across the country and committed to support the under-privileged children in remote areas was conceived and promoted by PBC Art Gallery to support Ekal Movement. The art show was inaugurated by Sri L.K Advani, former Deputy Prime Minister of India, on November 26, 2011 at the residence of Sri Kamal Meattle of Paharpur Group at 26, Prithviraj Road, New Delhi. The occasion was graced by H.E. A Peter Burleigh, Ambassador of USA, H.E. Jaime Nualart, Ambassador of Mexico, HE Jorge Ayres Roza De Oliveira, Ambassador of Portugal, HE Karen Tan, High Commissioner of Singapore. Apart from these, many other prominent VIPs and art connoisseurs were also present to appreciate and support the cause. Unlike any other Art Show, Samvedna holds utmost relevance to the Ekal School children as all the proceeds from sales were towards educating them. On this occasion, an MoU was also signed between Friends of Tribals Society and Climate Reality Project India – for the inclusion of environment education as another dimension in the curriculam of the Ekal education program. Sri L.K. Advani appreciated the initiative by PBC art gallery for a social cause and also spoke high about the greater need and significance of imparting education to tribal/rural children. He immensely applauded the efforts of Ekal Movement for reaching out to Rural Bharat with its education mission. Ekal Abhiyan SVO Karnataka had organized a Nagar Orientation Course for Anchal Samiti members from Karnataka Kshetra in November 2011, at Belgaum. Sri Ajeya Parikh, Saha Sangathan Prabhari, Ekal Vidyalaya Abhiyan along with Dr. C.Satheesh Kumar, Coordinator, Ekal Global conducted the course. 41 Members from different Anchals participated in a day long varg. Dr. C. Satheesh Kumar gave the overall view of the Ekal working and explained the Ekal Yojana with the help of a presentation in the first session. Sri Ajeya explained the role of the Anchal Samitis and its members, followed by queries from the members which he explained during the second session. After the lunch break Dr. C. Satheesh Kumar explained in depth the role of Abhiyan Prabhari, Mulyankan Prabhari and Vyavastha Prabhari and the concepts of Village Care Family, Abhibhavak and their role. Sri Suhasrao Hiremath, Akhil Bharatiya Saha Seva Pramukh was also present. In his address, he spoke how he is impressed with the work the Ekal Yojana has been doing in the remote and rural part of our country and complimented members of Anchal samitis and SVO for being part of this noble cause of nation building. We left Delhi at around 7 am accompanied by Sri Vijay Sethi, Member, Working Committee, Ekal Vidyalaya Foundation of India and Sri Navin Prasad. At Alwar town, we were received by the Ekal volunteers of the region – Sri Rajesh Bansal, Sri Giridhari Mishra and Sri Rameshwar Dayal. Thereafter, one of the Ekal volunteer guided the way on his motorcycle and we reached the Sariska Tiger sanctuary guest house – refreshed and then resumed our journey through a stretch of road through the forests – which was in a very bad condition, for around 12 kms. Finally, we had to turn onto another mud road and it was another 15 Kms stretch before we finally reached the village at around 12.30 pm. The route on the way to the village was scenic and beautiful – rural India at its best. We were warmly received by the village chieftain and his deputies and we were utterly surprised to see the whole village of around 150 villagers - including women, men, teenagers and children welcoming us. It was a grand reception – with drum beats, colorful red rajasthani turban being tied around our head, and then we were anointed with ‘tilak’ on our forehead and enjoyed a camel ride before we finally reached the Ekal School. The video and photographs will provide a vivid picture of what had actually experienced. (a)	38 students were nicely dressed in simple clothes and sitting in neat rows in a small room. (b)	The school had started in this academic year April 2011. (c)	They had a set of books which were of both maths and language. (d)	The teacher was a girl student who we were told is studying in the 12th standard – she travels by foot to reach her school which is more than 5 Kms away. (e)	Nearby, there was a Govt. school and we were surprised to see that some of the students who were studying in the Govt. School were also attending the Ekal School. (f)	Students were much disciplined and followed the teacher’s instructions – maths was taught and students solved the problem of addition and subtraction, they sang together in good rhythm and was happy to note that they are also aware to the Indian culture and heritage. (g)	Students displayed high level of interest, enthusiasm and keenness- they were asked what they would like to become when they grow up – there were various answers like doctor, teacher, police, engineer, farmer etc. (h)	The parents of the children and other children in the village were all watching the proceedings from the windows and doors with a lot of excitement. (i)	We witnessed outdoor activities where the children played a few games – it was fun and pleasure for both the children who were participating as well as for the onlookers. 3. To enhance the standards of cleanliness in the village for the good of the community. We left the village around 6 pm just before dusk to travel back to the government guest house where Mr. Sethi had been kind enough to arrange the accommodation. We were surprised to see on the way to the village, cart loads of huge wooden logs of trees – which is a matter of concern for all of us, especially in a state where rain is scarce. We reached the Tiger lodge around 8 pm as the road was in poor condition. It was tempting to stay overnight in the village but felt that – it would be too much of inconvenience to the kind village community. Next day i.e. 11th morning we left for Delhi via Alwar. We were treated to a delicious meal at the residence of Sri Rajesh Bansal, who has been associated for around five years with Ekal. He and his associates gave us the following information. (a)	In Rajasthan state, Ekal operates 1650 schools. (b)	Alwar district has 270 schools and Bharatput has 90 schools. (c)	250 full time Ekal workers are operating in the region.- They see that the schools are run as per the instructions given to them, to motivate the children and villagers, to create awareness amongst all in the basics-‘Right to information’ etc. A training session of Ekal Volunteers was on at Alwar – and we had the opportunity to visit on our way back – there were around 20 volunteers who were attired in whites and we had the privilege of meeting them. They displayed a good sense of satisfaction at the work they are doing and how they are contributing in bringing a positive change in the society in the region. They were given water bottles by the organizers and we were asked to distribute a few of them. We had a discussion followed with a question answer session and they were motivated to continue the good work for the benefit of the children, the villagers, the community and themselves. We reached Delhi late in the night of 11th November – tired but all had smiles on their faces as the visit was eventful, purposeful and successful. The trip was coordinated by Sri Pradeep Goyal and Sri Gopal ji at Mumbai. The transport and all administrative arrangements were made by office of Rosy Blue Diamonds, Mumbai office. We left from Mumbai at around 6.15 am and reached the village around 2.30 pm after a road journey of nearly 250 kms, out of which around 45 kms was hilly terrain. We were scheduled to reach around 11 am, but got delayed due to traffic disruptions on the way as at many places religious processions were on and also in some patches, the road condition was bad. When we were about to reach the village, we saw the villagers gathering together to receive us treating us like VIPs. There was drum beating and we saw more and more villagers coming- it was a small village with around 60 adults and children. One of the ladies performed ‘aarti’ and tilak was put on our foreheads and we proceeded to the school. 1. The classroom had 17 children of various age groups -from 6 to 13 years. 2. The school is running since 2008. 3. The Ekal class was being conducted in a ‘community hall’. 4. There were a number of charts/educational materials displayed on the walls. 5. The teacher was Sri Prakash Vaman Lohakare who is himself only a matriculate and was doing a good job – teaching maths, language etc. 6. The students had books and also a bag which had been donated by a donor in Pune. 7. The students were very obedient and did participate in the question/answer session – they were asked what they would like to do when they grow up and their answers were that they would like to be a doctor, police, military, nurse etc. – they were good in general knowledge too. 9. One of the girl students sang a devotional song which was appreciated by all. The children and adults were heartily congratulated for their participation and involvement and encouraged to continue in the same spirit as also it helps to protect the country’s rich heritage and culture. At the end of the session, chocolates were distributed to both the children and adults. All the volunteers were served a nice simple lunch by the villagers. I was impressed by the warm hospitality of the villagers while they served the lunch. The villagers informed that the ‘Ekal experience’ has been positive and constructive for the village and the community and the children have a good platform to study and are also exposed to culture of the country. It was interesting to note that they had ‘sat sang samitis’ – which are spiritual gatherings where villagers spend time constructively and intelligently together singing bhajans etc. When enquired whether they have any problems, they informed that during this rainy season, the roof of the community hall was leaking and that they are not in a position to repair the same due to financial constraints. Further, the drinking water from the well is around 3 kms away. The village did have limited power connection. We left the village at around 5 pm and reached Mumbai at 2 am on 19th November 2011 – physically exhausted but mentally fresh and happy that we are working for a higher purpose and a noble cause. 2. Junnar has total of 77 schools. Vermi compost project is on in 14 villages and there are eight full time volunteers. 3. Ghodegaon Taluka has total of 90 schools. Vermicompost project in 21 villages and eight full time volunteers. 4. Total number of students who have benefited in both the talukas is 3417. 1. The Van Yatra to both the Ekal schools was truly enriching, rewarding and a great learning experience. 2. We must encourage more and more visits by volunteers/donors/potential donors. Seeing isbelieving and one gets a better insight and perspective of the ground reality. 3. We should look at the possibility of providing solar energy to the schools and also giving the children slates/pencils/bags/simple sports kits – which can be standardized? 4. The standard of cleanliness in the Balveerwadi was quite high and credit goes to the village community whereas in the village Bagadio Ki Dhani in Alwar district – the approach to the village was full of plastic waste, garbage etc. 5. Villages can be educated on the harmful effects of using plastic and to enhance hygiene standards. 6. Children and villagers need to be educated on the importance of protecting their trees, flora and fauna. 7. To check with all villages whether the classes do get disrupted during rainy seasons and to find remedial measures for the same. 8. We can involve the senior school/college students to undertake community work/projects in Ekal villages – invite suggestions on how to develop rural/tribal India and how we can also learn from the villagers and the villages.